vivian Hutchinson is the editor of The Jobs Letter and a trustee of The Jobs Research Trust. He is also the Community Adviser to the New Zealand Mayors Taskforce for Jobs. This paper is based on several of his speeches to the Adelaide Festival of Ideas held in Adelaide, South Australia 7-10 July 2005. I am the first speaker from New Zealand that you have invited to the Adelaide Festival of Ideas ... so let me bring you greetings from your cousins from across the Tasman. And, on behalf of these cousins, I want to pay my respects to the Kaurna people who have been custodians of this place for tens of thousands of years, to greet your mountains, and rivers and sacred places ... and to salute the unique public purpose of this Adelaide gathering. It’s great that this Festival of Ideas has started with a question ... because questions are far more dangerous than ideas. There is indeed something more powerful than “an idea whose time has come” ... and that is a question — a question whose time is yet to be. Questions come before ideas. Questions breed ideas. They are generative ... they are creative ... and the best questions are almost always unsettling. A good inquiry tips you into the unknown ... and you start to reassess the ideas that you are already carrying. It is great to have a city that is celebrating this generative and unsettling process by having a week dedicated to the celebration of ideas. Adelaide not only started this type of festival, but, together with your “Thinkers-in-Residence” programme, you have put yourself on the map as a place that is inviting and fostering innovation and creativity. You are telling the world that, in the words of Mike Rann, State Premier of South Australia, you are not afraid to “shake things up”. We are told that this is the Information Age ... so it can only be a good thing for a city and a State to be well known for its ideas. But you haven’t invited a public intellectual or renowned academic from New Zealand ... you have invited a community activist and a social entrepreneur that is in the business of “shaking things up”. And, like most community activists, I am in the service of a time that is yet to be. So it is in this spirit that I have come to Adelaide ... looking for that face of your city that would like to be just as well known for the questions it is asking itself. I’m here to talk about unemployment and welfare issues and try and address the question of: What is to be done? I could spend most of the next 45 minutes telling you what I have been doing. If I did that, I would tell you about my work over the last 30 years in establishing work schemes and training programmes for the unemployed, setting up local enterprise centres, and economic development units, establishing the skills of enterprise training programmes for unemployed people, and establishing a community media project called The Jobs Letter which every two or three weeks keeps people in touch with the current issues and opportunities in addressing unemployment and poverty in New Zealand. More recently, I have been working with local government and setting up a network of Mayors called the Mayors Taskforce for Jobs. I am doing this work because I don’t want to live in a country that has no use for a large number of its young people. I’m doing it because I am angry that we seem to continue to run an economic system that leaves a large number of people behind. I’m serving a vision that is yet to be. This is a vision in which all young people grow up in our communities to discover their life’s work ... and can also find a livelihood that enables them to get on with it. This is a vision that comes with insurmountable opportunities to do something about it. And it has pretty well kept me occupied since I was, myself, a young person. I want to start off by acknowledging that both our countries seem to be doing relatively well in terms of jobs at the moment. In fact, some commentators are telling us that the issue of unemployment and poverty needn’t even be on the agenda these days. Our Labour Government in New Zealand is going to the elections in a few weeks time with a pretty good track record of job creation. It has had something of an economic dream ride — Labour’s whole time in office has been during a time of economic recovery. And they’ve seen 334,000 jobs created since the latest economic recovery started in 1998. The New Zealand unemployment rate is at 3.9%, which means there are about 83,000 people on our official unemployment list. This rate makes us the second best in the OECD (which has an average unemployment rate of nearly 7%). And its not just the Kiwis that are doing well. The two countries we most regularly compare ourselves to are also creating jobs — you here in Australia have an unemployment rate of 5.1% and Britain is on 4.6%. So ... its probably not surprising that some politicians and media commentators are telling us that there really is no need for any special concern. Perhaps those of us who have been working for more employment opportunities can pack up now and go home and declare a job well done? Well ... no. While I am indeed “raising a glass” to the improvement in opportunities for many people and families I care about ... I’m not dancing in the street just yet. That’s because I am still working for full employment. You see, its not just that there’s a lot of people who are out of work and want a job and don’t get onto the official unemployment statistics. (We still count them ... and in New Zealand we have as many as 160,000 people who are officially “jobless”). For me, full employment is a political and cultural commitment which means that all these 160,000 people should be able to find decent work that gives them a good livelihood. It’s a matter of getting the statistics .... these thousands of people ... into perspective. There was a time when even the official level of 83,000 people unemployed would have been a cause for outrage, not celebration. Helen Clark’s Labour government might be going into the next election with what they think are good numbers. But, only a generation ago, Norm Kirk’s Labour government would have been hanging its head in shame. Perhaps the real political and cultural task in front of us at the moment is to regain our generational memories of what our expectations should be. In 1985, just after David Lange and Roger Douglas’s reforming Labour government got in, I was invited along with many other community leaders to our Parliamentary Beehive building to an Employment Promotion Conference. It was the most extensive and high-level public summit ever held in New Zealand on the jobs issue ... and, at this meeting, unemployment was officially acknowledged as a crisis. The number on the unemployment register at the time was about 50,000 people. Australians have a similar story to tell. The programme committee chairman of this Festival, Mark Cully, told me that his family emigrated to Adelaide from Northern Ireland 40 years ago. When they landed in Adelaide, the unemployment rate was just over 1% ... and his father was able to walk straight into a job. This wasn’t an accident, it wasn’t a fluke. This was the economic design of that time ... it was the fruit of a post-war full employment political culture. Full employment was one of the great political and cultural achievements of the post-World War II generation, and it was a mainstream political goal that we struggled towards for most of the first half of the 20th century. This is why one of our major political movements that emerged at that time named itself after our ability to make a contribution through our work. The post-World War II generation knew that our communities are based on livelihood. These people also understood that the best social security and welfare policies are those that are anchored in full employment policies. Unemployment isn’t just an economic and social issue — it’s a governance issue. For the post-World War II generation, creating a culture of full employment was considered part of the art of governance ... regardless of your political stripes. But somehow, in the most recent generation, we have lost not only the political commitment, but also our cultural commitment to full employment policies. I’m not saying we should go back to the era of the 1950s and 1960s. It is not as simplistic as that. But I am saying that, as we move forward, we are going to have to re-discover a fresh commitment to what full employment means today. Even at a time when we are doing relatively well with the employment figures ... we can still easily see that something is still wrong with our fundamental economic framework. When we started the Mayors Taskforce for Jobs in 2000, most of the Mayors were concerned about high levels of unemployment, welfare issues, and how to get their young people into training and employment. But today the main issues have changed. Now the major concern the Mayors are talking about is skill shortages, and the problems these shortages are causing amidst our growing economy. Perhaps we always thought there would be enough people to wire up our lights, unblock our toilets, fix our cars and build houses that don’t leak ... while our education system spent twenty years telling our kids that they should become lawyers, or accountants or make careers for themselves in “marketing”. We now know that couldn’t last. New Zealand is gripped in a skills shortage crisis and it isn’t just happening in a few areas —it is right across all the trades. We are short of automotive electricians, bakers, boat builders, bricklayers, butchers, cabinet makers, carpenters, diesel mechanics, electricians, fitters and turners, welders, hairdressers, motor mechanics, panel beaters, plumbers and sheet metal workers. The latest surveys tell us that we are only filling half the advertised jobs in all of these areas after 2-3 months of advertising. So you can see why our Mayors are concerned: these are the jobs that hold our communities together. Now this has immediately lead to a loss of business investment in the New Zealand economy. The latest Grant Thornton survey of business owners tells us that 50% of the owners say that the skill shortages are their biggest constraint on plans for business expansion in New Zealand. That 50% level of concern that is nearly twice the global average of concern which is running at 28%. And our education system isn’t filling the gaps fast enough. We’ve got systemic problems in our education system that nobody really wants to talk about. Our brightest young people are voting with their feet ... and a quarter of all New Zealanders with tertiary education have now left our country. This represents the biggest exodus of skilled workers compared to any other developed nation. You’ve got similar problems here ... but New Zealand is losing our smartest young people at a rate that is ten times worse than Australia. The skills shortages are a crisis for New Zealand ... but they are just the other side of the crisis we used to have with unemployment. It is important to realise that unemployment and skill shortages are really the same problem. They both relate to a failure of governance. They both relate to our inability to invest in and plan for the next generation of our workers. I’m speaking culturally here ... I am speaking about a failure of governance not only in terms of national and local authorities, but also the governance that is found within businesses, and at all levels of civil society. You can’t blame young people for not having the skills that are needed in today’s expanding economies. By the time that skill shortages arrive in our communities, they are governance problems that are already ten years old. Our governance problem here is an inability to be able to think and plan for the longer-term view ... and to invest in people and their skills at the right time. The second clear evidence that our economy has some deeper problems can be seen in the employment of young people. Yes, we can all tell stories of how most young people are doing quite well at the moment ... but there’s a significant number — around one in five — who are having a hard time connecting with the opportunities in our growing economies. Despite these being “the best of times”, these young people are simply being left behind. In New Zealand about 15-20% of young people are leaving the education system without any qualifications. In my own city, the figure is as high as 25% — that’s one in four young people. We’ve known about this systemic problem for too long ... and we don’t really have a comprehensive strategy to deal with it. And its our loss ... well educated, engaged, questioning, creative young people are the currency of a global economy, and we can’t afford to leave any of them behind. This is another thing we seem to have forgotten in the last generation: that youth employment is a social purpose. It always was. But, over the last twenty years, we abandoned many of the support structures we had in place in the 1950s and 1960s — things like apprenticeships and cadetships and all the training that took place in the public sector — which were part of expressing this social purpose. We just can’t leave it to the market and the business sector to come up with all the opportunities and support structures that are needed to help young people make the transition from school to work. You can appreciate the business point of view: getting a young person into employment is something that you cannot necessarily expect to see a direct return from in the next quarter, or even in the next year. And because youth employment is really a social purpose ... it is up to our culture to invest in it. The public and community sector have to get in alongside business and work together to make it happen. Youth employment is a “whole of community” purpose. This is why I have been working with Mayors and local government to help recreate apprenticeships and cadetships for young people. We’ve also been speaking to businesses about making the governance case (in business terms) for why they should be taking on many more young people. And we’ve been speaking to schools about getting their careers advice and relationships with local businesses up to scratch, and establishing “Connections” schemes that can track young people once they leave school and stay with them until they are on a positive pathway on which they can support themselves. A culture of full employment means having the political and cultural commitment to ensure that no-one is left behind. The paradox of unemployment is that we are surrounded by an abundance of good work to do. Much of this work is pressing and urgent in our communities, and we would all be much better off if this work was done. Like the unemployed themselves, much of this work is simply waiting to be valued. Beyond our usual notions of economic development .... there are two sectors with enormous potential for fuller employment. The first sector contains all those jobs that come from choosing to look after one another better. The second sector contains those jobs that come from choosing to look after the earth better. These sectors are not driven simplistically by market desire. They are driven by the governance choices that communities make through their leaders. The jobs are there. We simply need to choose to value them and value our investment in the people that can do them. That’s all a bit of background and some of the current concerns that I am working on. The organisers of this Festival have asked me to reach beneath the concerns and projects and initiatives I am involved in ... and talk about the ideas that are driving my work as a community activist and a social entrepreneur. To do this, they have put me on several panels over the next few days with the curious titles of “How To Be Good”, “Working in Marginalised Communities”, and “The Activist’s Handbook”. I must say that I don’t profess to be an expert in any of these areas ... and I was particularly thrown by the title of the session on “How to be Good”. But I was reassured by the programme notes that told me that speakers were often asked to be on panels that “... were at the edge of their expertise”. The very next morning, a group of advisers met in the Mayor’s lounge and cautioned against the proposal. One of them said: “You can’t do that ... the next thing you know, Hutchinson will have you marching on Parliament.” (... which he seemed to think was one of my pastimes). I’m thankful that the core group of Mayors made up their own minds on the matter. And I think it is interesting that the call to form the Taskforce for Jobs did not come from the policy advisers, or the existing local government organisations. It came from someone who was working in their communities. Anyway, at the first meeting of the Taskforce for Jobs, over half the Mayors in New Zealand turned up. It had never happened before in the history of our local government that so many Mayors had come together on what was essentially a social and economic issue. Today we have 68 Mayors that are members of the Taskforce ... which represents 92% of all Mayors in New Zealand. There are only six Mayors in the whole country who are not members. Last year I was helping organise the AGM of the Taskforce, which is held at the same time as the main Local Government AGM. I was standing in the foyer of the Aotea Centre in Auckland during one of the coffee breaks, and there was a man walking around who was a senior partner of one of the prominent legal firms that was working for one of the larger councils. He was talking with a group of Mayors ... and he stood engrossed as they told him stories about starting up cadetships and apprenticeship schemes in their councils to employ young people, creating schemes that are going to track young people once they leave school, holding graduation ceremonies for apprentices in order to boost the profile of the trades at a time of skill shortages ... and meeting with government departments and government ministers in order to create plans that would ensure that every young person in New Zealand is either in work or education. Community activism is an expression of our citizenship. It is about that part of us that speaks to and looks after the common good. Activating citizenship ... activating this work for the common good ... is the job description of a community activist. And this is cultural work. This Festival of Ideas is dedicated to the work of Basil Hetzel, the Adelaide man who put iodine into our salt after he established the casual link between iodine deficiency and brain damage. Basil is not just a public health advocate ... and on the opening night of this Festival we heard a stunning speech from him condemning the social costs of neo-liberal economics. I think it is important to point out that the neo-liberal revolution has not just been about economics and public policies ... it has also been a cultural assault. It has been an assault on our very idea of citizenship. We have begun to see a reduction of our sense of citizenship until it is understood primarily in consumer terms. Citizenship has become replaced by seeing ourselves as customers in a political process. Citizenship becomes redefined as some sort of shopping experience that is practiced once every three years. This is a reduction of our humanity .... and it is a cultural loss. It is a cultural loss because it strips away our ability to speak to each other authentically about the craft of goodness, and the work that we need to do for the common good. We can blame the media, and blame that variety of anger known as cynicism. But actually ... we have done it to ourselves. We let it happen. We now need to push out the boundaries of our current understanding of citizenship. This is a cultural job ... and community activists are the foot soldiers of this task. And when we get on with this job, we rediscover that what stands between us and greater goodness in our communities ... is the authenticity of simply asking it of each other. I have had the good fortune of having some great mentors in my life. These have been people who have helped me learn to ask deeper questions of myself. Firstly, Where is my Place? ... and, for me, I was fortunate to have been born there, in Taranaki, on the North Island of New Zealand. The second question is, What is my Story? Well ... that’s a little bit harder to answer, but an important one to sort out before you go looking for a job, or a partner. But the third important question is, What is my contribution to the Common Good? These are initiation questions. They are the sort of questions that spark the sort of “growing up” that marks the transition from adolescent consumer to adult citizen. I believe that one of the greater abuses of young people is not to help them ask these questions ... and not to see and celebrate their contribution to a common good. This is the job of aunts and uncles and coaches and mentors. This is the job of culture. This is how we take our young people past the notion that their lives are simply one of being customers and consumers ... to help them find that piece of work for the common good that has their name on it. In doing so, we activate the deeper citizenship we know will be needed in the next generation. If I was to write a handbook for community activists, the first chapter would be devoted to the importance of asking deeper questions. This relates to this Festival and its theme ... because it took me nearly fifteen years before I realised that a question like What is to be done? is almost always never the right place to start. This is a real challenge to the “can-do” enthusiasm that is part of the character of both New Zealanders and Australians. We ask What is to be done? far too quickly, and far too eagerly. We are so focused on whether or not we are doing things right ... that we forget to ask ourselves: Are we doing the right things? What is to be done? is essentially a “how-to” question ... but the governance questions challenge us to go to another whole layer underneath this. The governance questions ask: What is it for? What is it serving? Whether you are a community activist, or working in social services, or if you are a politician or a philanthropist ... you need to be able to ask yourself: Am I in the business of organising problems ... or am I in the business of healing them? You need to ask these questions first, before you ask yourself: What is to be done? I know so many unemployment and welfare schemes that are doing great work. But I do believe that many of my colleagues have their heads down so far into their contracts, and survival, and the management of all the details ... that we can all miss the point of what we are doing. That’s the kindest way I can put it. I could also say that in the last twenty years we have seen the growth of a huge unemployment and poverty industry ... all very busy ... all working some very lucrative contracts ... and we have large numbers of unemployed people in New Zealand who are just on a treadmill of training courses, and special programmes, and all sorts of professional “interventions”. It’s big business. Yet the main social and economic problems are still with us, and don’t look as though they are going away. We have to be able to ask ourselves: Are we really just organising our problems? Paul Matheson is the Mayor of Nelson — a city at the top end of our South Island — and he is also the deputy chairman of our Taskforce for Jobs. Because our main mission is focused on young people, he decided he would try and find out just how many local organisations exist that are focused on youth issues and in some way are funded either locally or direct from government. He nearly fell off his chair when his advisers came back and gave him a list of 160 different groups. He had never heard of most of them ... and he suspected that most of them didn’t know about each other. And it is a curious thing that, despite having all these groups, not one of them was charged with the responsibility of “staying in connection” with the young person until they got a positive outcome. As Mayor, he was in a good position to sit back and ask the question: How many of these programmes are being funded to simply organise our problems? How many of these programmes are working to fundamentally change the nature of youth issues in the city? Asking yourself these questions is a central challenge to anyone in governance. If we think we are in the business of healing our social problems, then I believe we need to spend at least part of our work in exploring how our problems can be fundamentally changed. When you start to get a handle on the difference between organising a problem, and healing it ... then you start to also re-examine the difference between creating local self-help initiatives and working for fundamental systemic change. I’m not suggesting that these two things can’t happen together. But I do observe that it isn’t usually the case. When I was running business courses for unemployed people, I used to use a very familiar Chinese proverb in my work: If you give a man a fish, you feed him for a day. But if you teach him how to fish, you feed him forever. Our local self-help employment projects were very much about fostering personal enterprise, and teaching people “how to fish” for the goals they wanted to achieve in their personal lives and livelihood. But it took me many years to realise that no matter how many self-help projects I was organising ... and being considered a local hero for all this good work ... I still wasn’t making much of a dent in the overall levels of unemployment in my community. It was a challenge to ask myself: what business am I really in? I remember walking up my local beach at dusk one evening and I could see the lights of the foreign-owned squid boats and fishing trawlers out on the horizon. This is a very regular sight from the Taranaki coastline, but it was particularly interesting to me that day because I had just been writing about the troubles New Zealand has had in growing a local fishing industry – with more jobs for our young people who are keen to work at sea. It’s especially an uphill battle when fishing quotas are sold to foreign fishing interests who send fleets down to the Tasman Sea from Asia ... with boats on our horizon that have working conditions that few New Zealanders would put up with for long. It struck me at that moment that I had been making a conceptual mistake in my drive for self-help employment opportunities. The fact is that I can “teach a man to fish” as much as I liked ... but there are trawlers coming into our harbour! This story became something of a personal allegory: It taught me that unless we can engage in the systemic levels surrounding our social problems ... then we are never really going to find the solutions we are looking for. When you start asking deeper questions about work in our communities ... then you start talking about livelihoods rather than just jobs. And the governance task becomes one of creating the climate for sustainable livelihoods to grow and thrive. The key word here is sustainability. In both our countries, we have had a history of economic development driven by an extractive and boom-and-bust mentality. Whether it is fishing or farming or forestry or mining ... our communities have boomed-and-busted right along with it. And we have left behind the environmental damage that is a testament to this short-term extractive thinking. I don’t need to speak here about the environmental challenges on your own continent which is already showing the scars of land abuse and the effects of climate change. There are much better informed and more eloquent speakers at this Festival of Ideas who will do this better than me. But it is important to realise that the biggest threat to the Australian economy and the Australian way of life is not coming from terrorism ... but from your longer-term environmental challenges. This is not just an Australian challenge, but a challenge everyone is now facing around the world ... the United Nations tells us that the biggest number of refugees in the world are not fleeing terrorism but they are environmental refugees. The full employment policies that we will need to regain in the next generation cannot be held hostage to the usual boom-and-bust mentality. This is the challenge of creating sustainable livelihoods ... and it will require a different governance mind. A couple of years ago, in order to foster a different mind on these matters, the New Zealand government made a fundamental change to our main local government legislation. It wrote into the 2002 Local Government Act the ethic of sustainable development. This spelt out that the “social, economic, environmental and cultural well-being” of our communities would now be a direct responsibility for councils and local authorities. And it gave the councils greater “powers of competence” in order to get on with the job. This has been a bit of a fright for some people involved in local government — those representatives who said they were only ever going to get involved in “road, rats and rates”. But the new Local Government Act has quickly become an important legislative mandate for people to start to locally address their social, economic, environmental and cultural goals. And the councils are now required by legislation to spell out these goals in their Long-Term Council and Community Plans (LTCCP). We have an independent Parliamentary Commissioner for the Environment, Morgan Williams, who has done a lot of thinking and speaking about sustainable development for New Zealanders. One of the things he often says in his speeches is that “the only sustainable solution is a systemic solution.” This realisation requires us to think differently about the development work we are doing. When you apply this insight to the challenges of unemployment and social services ... then you quickly understand that the answers to our deeper problems are not going to be found in the simplistic creation of a new work scheme or training or welfare programme ... and the answers will not be achieved by targeting the people who you decide to be most “at risk”. No ... a systemic solution requires us to approach the task differently. It requires us to look at how the new and existing programmes can work together better ... and work together in a way that demonstrates a deeper understanding of what we are all serving. When we started the Mayors Taskforce for Jobs, the Mayors immediately said that they wanted all the young people under 25 years in their communities in either work or education. This quickly became the cultural vision of the Taskforce. Achieving a cultural goal like this requires systemic change. We need to create a way of working right across the community spectrum — working with education, with businesses, with government departments and labour market programmes, with parents and families, with churches and marae ... so that everybody can see and get on with their contribution to this common cultural purpose. It’s important to realise that such a cultural goal cannot be squeezed into a scheme or a programme. It has to be seen in a wider context — as part of a spectrum of measures that are going to get us back to a culture of full employment. This is how we have tried to approach our Mayors Taskforce initiatives. It helped that we immediately got good support from the Labour government who have signed up to a national goal that, by 2007, all young people under 20 will be in work or education. This national buy-in sets the right direction for a systemic approach ... and it helps re-align the resources of all the various government departments that have a contribution to this task. Last month I brought over to Newcastle a group of eight New Zealand Mayors to meet with their counterparts in New South Wales. The end result of that meeting is that it looks like the NSW Mayors will start their own Taskforce for Jobs in Australia. What’s missing is a systemic approach. And we desperately need a level of leadership that can speak across all the vested interests and institutional barriers. The national buy-in to the overall cultural goal has also been an important factor in getting the major government departments to work together better. I have to say that the biggest stumbling block to sustainable and systemic change on unemployment and welfare issues is the inability of all the main players — in government and the community — to work together better. The reality of this situation is actually the biggest “un-discussable” in our field. Remember the Nelson Mayor and his 160 different youth schemes ... most of these groups on his patch are being well funded under a “competitive tendering system” run by various government departments. We hear all the time that there aren’t enough resources to go around, but if you take a step back, like the Nelson Mayor has done, then you quickly start to realise that we are already running a very expensive system. The stumbling block to real development is not the money. About seven years ago, a group in Manukau City in South Auckland commissioned a large accounting firm to work out the direct and indirect costs of every unemployed person under 25 years in Manukau City. They came up with a figure of $58,760 for every young unemployed person! So ... it doesn’t take much to see that the poor and the unemployed are actually a huge source of market activity for another whole class of people — people who have a vested interest in keeping on organising the problems rather than fundamentally healing them. We don’t talk about this enough. Too much of our attention goes straight to the problem ... straight to all the dysfunctional stories ... without looking around the edges to see why it really isn’t fundamentally changing, and realise who’s making a living out of it in the meantime. Former Cabinet Minister and Auckland Maori MP John Tamihere tells us that he knows of individual families in his constituency that have as many as fifteen separate government and community agencies working to different agendas ... on the one family. Of course this makes no sense ... especially if the family remains in poverty and dysfunction. Who is going to say that the welfare emperors have no clothes? How do we change things so that all these agencies work together better? I’ve just been working with a local project to try and get a sensible system of Community Case Management operating amongst the government and community agencies that are all working with the same young unemployed people in our area. Right from the start it has been a struggle getting the major players to co-operate with this community initiative. The defensiveness and patch protection has been almost brutal ... and for now, it looks as though we are going to have to walk away from this particular project. I suspect, however, that we will have to keep revisiting its purpose. But, if its any consolation, I read the Australian reports on youth employment and training, and they all come to similar conclusions: the need to work together better. Every recent strategic plan for action I have come across in the Australian reports talk about “the cultural and paradigm shifts that are needed in our institutions”, and “the need for us to collaborate”. They all use the same buzz-words, like trying to achieve a “whole of government” approach ... and I can’t tell you how many workshops I have been to where people have been espousing the virtues of working together better. But the most tangible outcome I can see so far is that every government department has started their own “whole of government” committees. Am I the only one who sees the tragic humour of this? My experience has been that the institutions just turn up to all these committee meetings to basically protect their own interests. They are all very nice about it. It is all done behind a screen of doubletalk about co-operation and collaboration and “partnership”. But nothing much changes. There is something to be learned here: A “whole of government” approach cannot just be the policy choice of institutions. It also has to be the personal governance choice of the individuals that are steering these institutions. It has to be a personal way that these key leaders are steering their institutions towards common sense. It’s great that after thirty years of community activism people start calling you a social entrepreneur. They can look at your track record and realise that you haven’t just been a trouble-maker ... you have also been in the business of innovation and creativity. If you are in the business of innovation, then you have to be able to make peace with your mistakes. I have created all sorts of programmes that have never made it to my CV ... because they didn’t work out. But I’ve learned a lot from these mistakes. Innovation isn’t just borne out of good ideas ... it is also generated from the mistakes. Making mistakes is all part of the craft of idea-making. It is the fear of mistakes that is the killer of innovation and creativity. I think there should be a panel session at this Festival of Ideas called “Great Mistakes I Have Made”... I’m sure it would be a popular session. This all relates to the current debate on welfare issues. I have no doubt that our present welfare state is unsustainable. We need to change. We need at least to start thinking about how to change. This is a time when we should be innovating and re-visioning just what we mean by social security in our nation-states today. We need to rethink what social security means in the context of a global economy. But when it comes to welfare issues, we are hamstrung when it comes to innovations. We have created a political climate around social security that has no tolerance for the mistakes that come from innovation. Let me give you a contrasting example about innovation from the business world. The Google company has grown since 1998 to be now the world’s biggest media organisation. It has just passed TimeWarner in terms of market value. And when Google went public in 2004, the spotlight went on how it does its business, and people found out some very interesting things. It seems that the Google founders Sergey Brin and Larry Page have an interesting way of fostering innovation. They say to their workers: you can spend 20% of your paid time on projects of your own choice. Many of Google’s new services have grown out of this intrapreneurship. Now, when you think about it, we just couldn’t do this with the business of welfare. Imagine saying to people working in our largest government department, the Ministry of Social Development, that they could spend 20% of their time — one day a week — on the things they are passionate about and they think should be done. All hell would break loose. At the first sign of a mistake, there’d be Questions asked in the House of Representatives, and there’d be a media frenzy about the waste of public money. And the end result is that the bland and nonsensical status quo gets reinforced and locked down. This is one reason why I am working with private philanthropy to try and support the work of social entrepreneurs. Private philanthropists are allowed to make mistakes. The media hardly takes any interest. The philanthropist is culturally allowed to take risks, to be foolish and fail ... because they are dealing with their own money. Private philanthropy can provide the sort of venture capital needed to create innovations for social change. They can get in behind the same social entrepreneurs that government departments have always written off as trouble-makers. And they can do this because the have the time to be in the business of healing, and not just organising, our major social problems. It is not just a challenge for us to work together better ... an important part of community activism today is in developing the places where we can learn and grow the arts of thinking together. Innovation is not just an individual thing. There are certain innovations, certain types of social entrepreneurship, that just don’t emerge unless a group of people starts to think together. This is one of the attractions of a city-wide gathering like this Festival of Ideas. By bringing together a great variety of public intellectuals you start to spark a synthesis of thinking between them — and between them and the public — that isn’t always able to take place. Back in New Zealand, I am involved in a small group of active citizens, and people involved in running social services, who have been exploring the arts of thinking together better. We have created an 8-day immersion learning experience that is influenced by the Maori learning traditions of wananga. This “learning community” has also drawn upon the work of the physicist David Bohm and his insights into the importance of human dialogue. About twenty years ago, David Bohm observed that one of the biggest challenges to human progress comes from the way we think. He said that we are not going to find solutions to our most complex human problems unless we grow a better way of thinking together. As our “learning community” has experimented with David Bohm’s dialogue processes, we found that the experience was not too different from what we sometimes experienced in Maori-style whaikorero, or circle sharings. There comes a stage in the dialogue process where a deeper layer of thinking together starts to take place. Participants start to tune into a layer of meaning that is beyond themselves as individuals. It can be a sacred and generative experience ... and a thousand-and-one practical outcomes and initiatives emerge from this dialogue space. David Bohm points out that we are constantly trapped in a cultural form of thinking that is almost always oppositional. The major agencies of our culture are predominantly oppositional in the way they approach the world ... whether it is in academia, in law, in parliament, in sport, or the media. The trouble is that the biggest problems we are discussing in this Festival — climate change, the end of cheap oil, race relations, the health system, unemployment and poverty — are all problems that will not be solved with the sort of oppositional thinking that we usually bring to the task. Perhaps, even in this Festival of Ideas, we have made the mistake of trying to squeeze everything into the domain of the mind ... without heeding the warning that one of the habits of the western mind is its oppositional nature. Last night I was in the audience during the panel session called “Designing the Universe”. I was intrigued by the level of aggressive tension between two of the speakers — Baroness Professor Susan Greenfield (who is the visiting Thinker-in-Residence, and an expert on the human brain), and Professor John Carroll from La Trobe University. They had launched into a debate about the difference between spirituality and scientific approaches to human knowledge. Actually, the interesting thing to me was not so much the content of their debate ... but how they were demonstrating the tension between these two approaches to human understanding. I was sitting next to John Polkinghorne who earlier in the day had given a speech about being a leading physicist at Cambridge and then making a mid-life change to becoming a theologian and an Anglican priest. He told us that he had learned that there was a common principle in both these paths: the search for truth. I was reminded of the Irish poet W.B.Yeats when he said that human beings cannot know the truth ... but they can embody it ... they can perform it. This is a subtle insight often missed in the world of crisis policy management. And it reminds me of the importance of having your artists, poets, musicians and dancers — and the odd community activist —walking alongside your public intellectuals and published academics. As an activist and social entrepreneur, I am highly motivated by the local self-help community projects that have made up a large part of my own working life. But once I started to realise that our employment problems are essentially a failure of governance ... I have started on the more obscure tasks of growing the people, growing the active citizenship, and growing the arts of leadership needed to make the better choices that we need today. I have a vision of a new breed of community organisations that will emerge in the coming generation. They will push out the boundaries of our current understanding of citizenship. While they will be dedicated to real service work, and they will also consider themselves to be learning organisations. They will be defined not so much by the promotion of a particular platform of policies ... but by the questions they are asking themselves. They will learn to create the spaces where we can discover the arts of thinking together, and the craft of reaching across differences. This Festival of Ideas seems a very good example of the sort of public event that can help us grow these thinking arts ... and inspire the innovative and creative actions that these community organisations will be keen to get on with. vivian Hutchinson is the editor of The Jobs Letter and Community Adviser to the Mayors Taskforce for Jobs. He has been a community activist and social entrepreneur on employment and livelihood issues since the 1970s, and has been one of the pioneers in community-based action for jobs in New Zealand, especially in establishing programmes for the support and education of unemployed people. He co-founded of The Jobs Research Trust in 1994, and helped establish the Mayors Taskforce for Jobs in 2000, and The Employment Catalyst Fund in 2001. The 2005 Festival of Ideas covered themes such as global warming, public health, and education ,the law, activism and philanthropy. Speakers included Germaine Greer, Theodore Dalrymple, John Polkinghorne, Robert Mathews, Morag Fraser, Elisabet Sahtouris, P. Sainath, Iman Feisal Abdul Rauf, Stephen Schneider, Jenny Shale, Jack Mundey, Eva Cox, Julian Burnside, Peter Botsman, Lisa Delpit and Larissa Behrendt. The 2005 Festival of Ideas was dedicated to the life work of Basil Hetzel, medical scientist and public health advocate, educator and global citizen and one of Australia’s 100 living national treasures. Basil Hetzel was responsible for identifying iodine deficiency as a major cause of mental health problems. He pursued the provision of iodine-based salts into areas where there was a natural lack of the substance – a process which has saved tens of thousands of people from iodine deficiency and other associated illnesses. Dr Hetzel was born in London in 1922 and was educated in Adelaide. vivian Hutchinson’s visit to the 2005 Adelaide Festival of Ideas was made possible with the support of the Myer Foundation. special thanks to Mark Cully, Rose Wright, and Lyn Wagstaff of the Festival organising committee. Statistics That Matter. The Jobs Letter’s quarterly summary of the New Zealand employment and unemployment statistics is at www.jobsletter.org.nz/stt/stathome.htm. trade skill shortages. New Zealand Department of Labour surveys show that employers are filling only four in ten jobs in all major trades and in some trades the fill rate is as low as one in six. See The Jobs Letter No. 228 (15 January 2005). 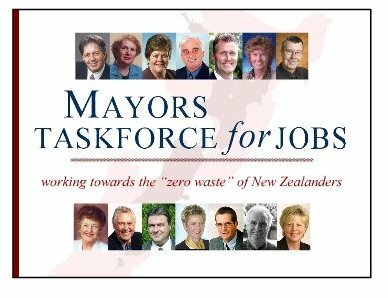 The New Zealand Mayors Taskforce for Jobs is working towards the “zero-waste” of New Zealanders. It has two main cultural goals: A Youth Guarantee — that all young people under 25 years be in paid work, in training or education, or in useful activities in our communities; and, A Job Guarantee — that all adults who are long-term unemployed (registered for more than 12 months) have the opportunity and are encouraged to be in paid work, in training or education, or in useful activities in our communities. Local Government Act 2002. The new Act is the most extensive change to Local Government legislation in New Zealand for over 100 years. The Act includes a requirement on local authorities to produce 10-year Community Plans that reflect community social, cultural, environmental and economic aspirations, in addition to existing financial, asset management and resource planning documents. Preparation of these plans requires a high level of community involvement and input. $58,760 for every young person. See The Costs of Youth Unemployment in Manukau report (1998) by the accounting firm Ernst and Young was commissioned by the Manukau Employment Consortium. LEC Project Manager for this research was Mark Barton of the Manukau Institute of Technology (interviewed by Vivian Hutchinson in March 2001). Google innovation. See “What’s so special about Google” by Rob Spiegel at www.businessknowhow.com/internet/googlesp.htm. environmental refugees. The World Disasters Report published annually by the International Federation of Red Cross and Red Crescent Societies says there are 5,000 new environmental refugees every day. The number of environmental refugees is expected to grow dramatically as a result of climatic factors leading to soil erosion, global warming, and water pollution. The Intergovernmental Panel on Climate Change (IPCC), the United Nations scientific body responsible for reviewing the causes and impact of climate change, forecasts 150 million environmental refugees by 2050.
dialogue. David Bohm (1917-94) was one of the foremost theoretical physicists of his generation and one of the most influential theorists of dialogue processes. In his later life, Bohm wrote and spoke of a worldview that places more focus on wholeness and process than analysis of separate parts. Bohm: “The widespread and pervasive distinctions between people (race, nation, family, profession, etc.) which are now preventing mankind from working together for the common good, and indeed, even for survival, have one of the key factors of their origin in a kind of thought that treats things as inherently divided, disconnected, and ‘broken up’ into yet smaller constituent parts.” — Wholesness and the Implicate Order, Introduction, p. xi. David Bohm developed his ideas on thought and metacognition through his many talks with the eastern spiritual sage Krishnamurti. Krishnamurti believed that humanity needed to make a fundamental shift in conciousness for transformation to occur in the world. He felt that war, environmental problems, and conflict of all kinds were the direct result of the limitations of human thought. By becoming aware at the individual level of how we create our reality through our thinking process, he felt we could affect a change in the human psyche, leading to a change in the world at large. William Butler Yeats (1865-1939): “Man can embody truth but he cannot know it ... ” (Letter 4 January 1939). The Jobs Research Trust was established in 1994 “… to develop and distribute information that will help our communities create more jobs and reduce unemployment and poverty in New Zealand.” The Trust’s main projects are the production of The Jobs Letter and its website. Previous speeches by vivian Hutchinson are available on his homepage on the internet at www.jobsletter.org.nz/vivian.htm.